This listing requires that you supply me with an .svg file of your drawing. It must be a scalable vector graphic with hairline boundaries and solid black fill. I can sometimes work on high resolution .png files, so that may also be an option, but they also must be black fill. You must also have all rights to the file. 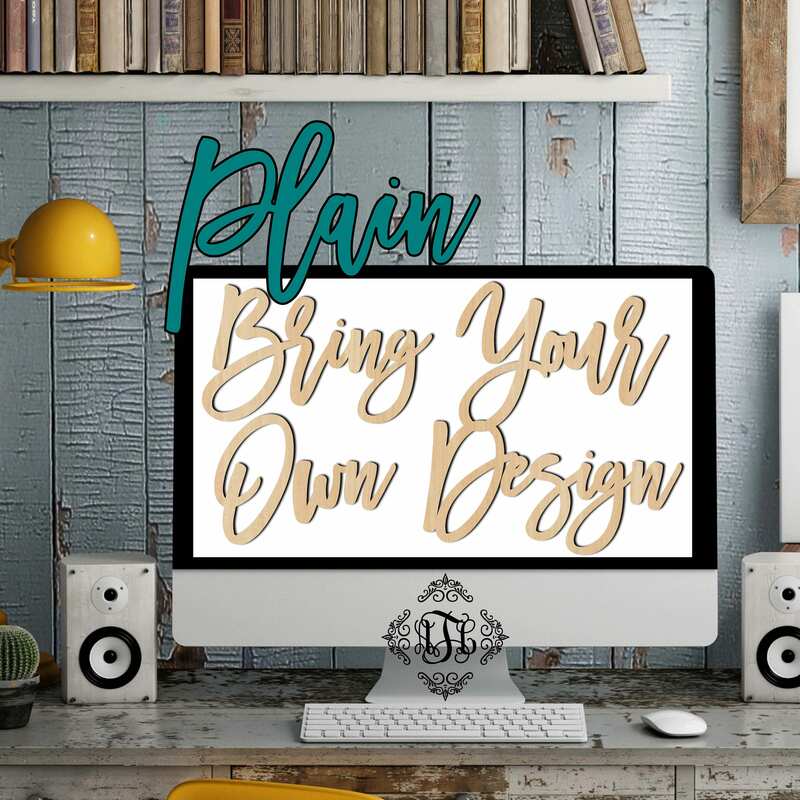 By purchasing this listing, you are acknowledging that you are the owner of the file and have full authority to reproduce the design on this medium. Below you will find all Bring Your Own Design listings. VOIDS are the cut out spaces within the solid piece of wood. For example, the inside of an 'o' or 'd', the hoop on an 'h', an eye, etc. Any inner part of a solid piece that has been cut out. 1)	Do not purchase this listing until I have seen your file, and I have determined that it can be converted to a cuttable piece. I will have to assess your file to see if the members are too thin. I will not change your design in any way. I may ask you to make some of the members of your file thicker for cutting/shipping purposes. We try to maintain at least 1/4" thickness on the face of the design at its smallest. Wider parts & pieces are best. 2)	Once I know what I am working with, I will give you feedback, and you can either make some changes or purchase this listing at the size you want for the longest side. Since it is a range, please tell me in the notes a specific dimension for your longest side should you need, otherwise, it will be cut at the longest extent of that range. 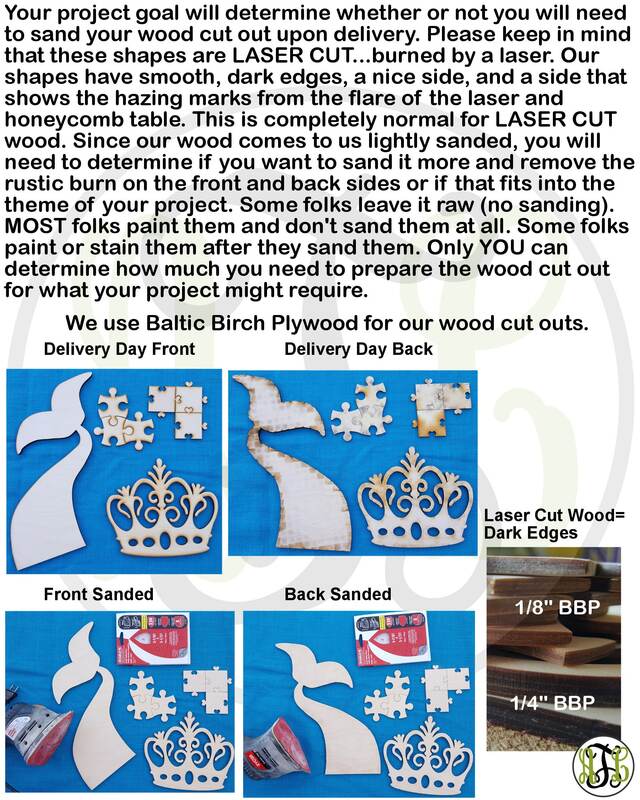 3)	I will submit your file to the shop to be cut and shipped your way. 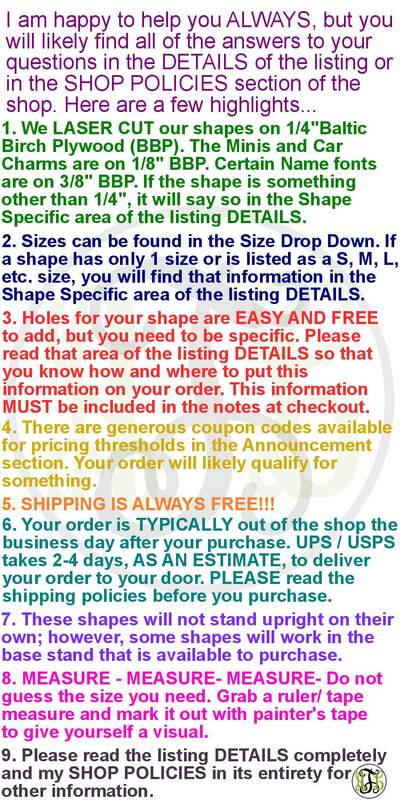 7) Coupon Codes are not allowed on this listing. 2)	I will start assessing your file within 12-48 hours of you sending it to me. How quickly you receive your order will be largely based on the number of revisions needed and your ability to respond quickly to my revision updates. 3)	Just so you know, I mostly do this design work in my spare time in the evenings. I have 2 very athletic boys, I work during the day, and we are a busy family in general. I ask that you give me time in this process (4-6 days) . Please do not expect your custom order ‘yesterday’. She came out wonderful. Thanks for cutting her out for me!